As promised here is my review, scribed in haste, from the second screening of Cave of Forgotten Dreams at the 2010 Toronto International Film Festival. Warner Herzog’s Cave of Forgotten Dreams is less of a documentary that a meditation of the filmmaker’s thoughts and impressions of the Paleolithic paintings found in the darkness of the Chauvet Caves. But, should we expect anything else from Herzog? 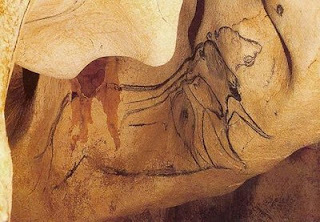 Located in Southern France, the caves of Chauvet contain the oldest cave paintings known to man, painted over 30,000 years ago. Due to the age and fragility of the artwork and artifacts found in the cave, Herzog and his small crew were limited to six days of shooting in the caves and only allowed 4 hours per day. The result is much introspective narration, delivered by Herzog, over long meditative shots of the cave walls’ rudimentary artwork photographed in three dimensions. As a result Cave of Forgotten Dreams is not a landmark moment for the 3-D documentary film, (after all IMAX 3-D has been showcasing stereoscopic cinema for decades), but it’s one of the first 3-D films that feels like cinema verite in 3-D. For fans of Herzog’s documentary films, Cave of Forgotten Dreams is a real treat, but more information about the Chauvet caves can be found on its wikipedia entry then in the film. Firstly what’s wrong with the film, from a stereoscopic point-of-view. A large number of scenes are presented in converted 3-D, pseudo 3-D or just plan technically poor 3-D. Many of these, such as Herzog and his crew’s first walk through of the cave (a scouting of the cave done before the 3-D cameras were ever involved), could have and should have been left alone and played flat. Much of the converted 3-D featuring humans in the cave is done with very loose matte lines creating a cut-out collage quality to it. In one dizzying scene, as the crew climb to the mouth of the caves, the camera man lets the run as he climbs the steep path. The resulting shot is sky and treetops. The resulting stereoscopic image is a tunnel built in flat layers, with as little dimensional realism to it as a magic eye image. (This section is so abstract and artificial that I chalk it up to Herzog having some optical fun with 3-D). An often used painting of horses within the film. However, when the true 3-D is used it’s a thing of beauty. After seeing the Paleolithic paintings on the curves and folds of the cave rock in 3 dimensions one can hardly imagine the images in flat. Nor would a 2 dimensional image of the cave art represent it in anyway as powerful as presented in 3 dimensions. Herzog’s vision to shoot these images in 3-D was definately the right decision. This is a rare flat image that represents the depth of the cave paintings in Chauvet. There are indeed other moments that showcase the 3-D process. A scientist who demonstrates spear throwing feels like it may have been included in the film for it’s 3-D imagery (with a backdrop of vineyards) and one wishes Herzog had been more whimsical with the staging, encouraging the man to point the arrow point further into the camera. I hoped for something stronger in the 3-D imagery of Cave of Forgotten Dreams, however Herzog is no real fan of 3-D films so it’s not that surprising that his one time venture into the process would come up a little short. It’s film-makers like Arch Obler or (shutter) James Cameron who had a lifetime investment in stereoscopic cinema who are the filmmakers to look to expanding the techniques of stereoscopic filmmaking. Herzog: “perhaps they are splitting off into their own doppelgangers”. The 3-d cinematography as well as Herzog’s narration gets a little trippy here, shooting swimming albino alligators so that we can see them simultaneously under and above the water. The water’s refraction creates a M.C. Esher type of optical illusion in 3-d, reflecting (so to speak) the doppelganger nature of the alligators. In real life our brain simply doesn’t interpret the hyperstereo image the way it is presented in this scene and we are presented with a visual puzzle that is close to the heart of Herzog’s work. Thanks. I've been a bit behind in my posting due to some things going on in my life (very good things). I hope to get back to this blog very soon.